RMC was the first to establish a trauma care ward for the exclusive benefit of the acutely injured in this region much on the same lines as the medical ICU. Here in this ward all monitoring and life support systems are available to monitor the progress of the patient and to intervene as and when necessary. The unit comprises a team of specialists of all disciplines and a multidisciplinary team approach is followed in the management of the acutely injured. This is a comprehensive unit which can manage all injuries especially head injuries , faciomaxillary , thoracic injuries , abdominal injuries , Pelvic injuries, Injuries of the spine , limbs ,hand and vascular injuries. 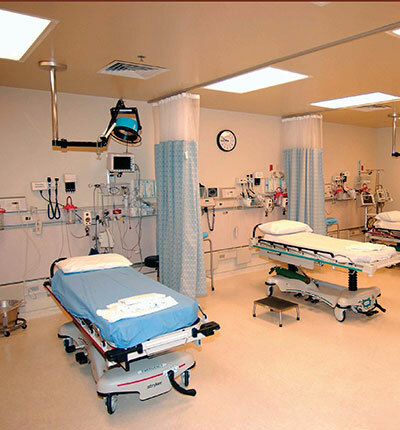 The availability of 24-hour laboratory, well equipped operation theatre, Ultrasound, CT scan all under one roof greatly aids in delivering quality trauma care without loss of time. The unit is supported by the department of Physiotherapy and by a fleet of sophisticated ambulances for transport of the critically injured. In addition a full-fledged blood bank, casualty and emergency services function round the clock.